In Jurassic Park, how was there a 100 ft. drop where the T-Rex just came from? 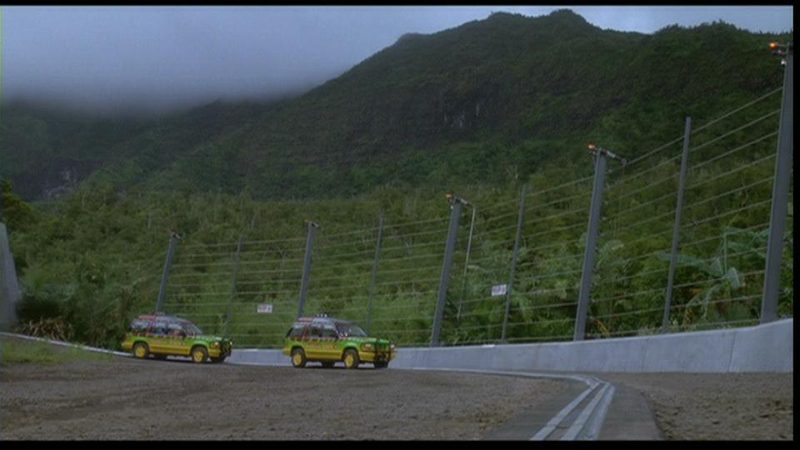 When the T-Rex attacks in Jurassic Park, the area on the other side of the fence has low-growing bushes and trees, as well as the spot where the goat was tied. In fact, the T-Rex is clearly seen walking on the ground. However, Dr. Grant escapes by rappelling down the other side of the concrete wall, which has a 100 ft. drop. How did this drop magically appear? In the wide shot you can even see that there's nowhere for the T-Rex to walk. Now, let's look at our film evidence: First we have the initial arrival. We can see here that the fence is quite long. If you look, the fence actually doesn't stretch all the way to the tunnel, instead, it all seems to converge into a small point next the tunnel. This would seemingly be an error-a gratuitous error-if the rex's range stretched all the way to the tunnel and further. This is our first hint that the paddock has a boundary further in. the T-rex starts to nudge the Explorer toward the barrier. Over the barrier, there is a gentle terraced area at one side where the rex emerged from, but the car isn't next to that, it's next to a sharp precipice, representing a fifty or sixty foot drop. This is something from the book that was not explained in the movie. (well, there was one throw away line that was easily missed) there is a moat between ground level in the T-rex paddock, and the fence. This exists to discourage the dinos from getting close to the fence. There were only six divisions on the whole island. 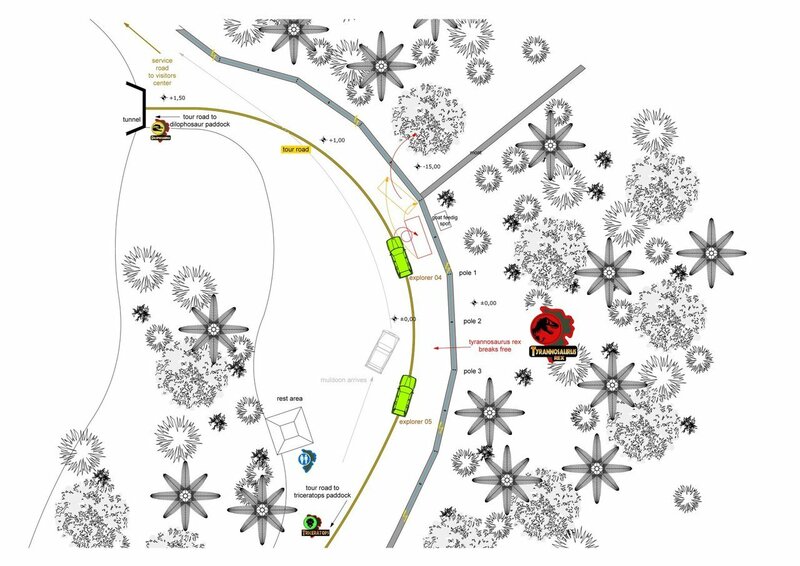 And each division was separated from the road by a concrete moat. "You know," Ellie said, "some of these dimensions are enormous. Look at this. This concrete moat is thirty feet wide. That's like a military fortification." "Absolutely not," Arnold said. "These are expensive animals, Mr. Gennaro. We take very good care of them. We maintain multiple barriers. First, the moats." He pressed a button, and the board lit up with a network of orange bars. "These moats are never less than twelve feet deep, and water-filled. For bigger animals the moats may be thirty feet deep. This is a very well-known continuity error. There is abaolutely no in-universe explanation. Unless the T-Rex could fly. Not the answer you're looking for? Browse other questions tagged jurassic-park or ask your own question. In the book “Jurassic Park” does the Lysine Contingency actually get explained? How old are the adult dinosaurs in Jurassic Park? Why was the Dragon Fractal in the Jurassic Park novel? In Jurassic Park, do we know which velociraptor is “the big one”? In Jurassic Park/World, wouldn't ducking behind a large tree work for the T-Rex?